Researching federal income tax law involves a variety of sources and there are several approaches that can be used. Legal Research by tax practitioners should involve becoming familiar with the Internal Revenue Code or at least comfortable finding the relevant code sections. After finding the appropriate code section it is important to find the corresponding treasury regulation for further guidance. Case law can interpret difficult to understand code sections. Administrative decisions can also be helpful but vary with respect to authority depending on the type of document. Documents that are intended for release to the public such as Revenue Rulings or Revenue Procedures are usually binding whereas documents that are released because of the Freedom of Information Act (FOIA) are non authoritative. The Internal Revenue Code is a compilation of tax statutes arranged by subject and is located under title 26 of the United States Code (U.S.C.). The Code is the foundation of all tax law and is the most authoritative source. The code is not very popular given that it is very difficult to interpret and use. Treasury Regulations are designed to interpret the internal revenue code. They are issued by the Department of Treasury with the intent of providing guidance to the code. Final Treasury Regulations are codified in the Code of Federal Regulations and announced in the Federal Register as Treasury Decisions. Treasury Decisions are also announced in the Internal Revenue Bulletin/Cumulative Bulletin. 1. There are three types of regulations. Proposed: Treasury Regulations typically go through a minimum 30 day notice and comment period. During this period professional organizations including the American Institute of Certified Public Accountants (AICPA) and the American Bar Association (ABA) can review the proposed regulations and make comments and suggestions for changes. Proposed regulations are not considered to be binding until they are finalized. Final: Final regulations are authoritative as long as they are “reasonable and consistent interpretations” of the code. Once final regulations are issued they are announced in the Federal Register and codified in the Code of Federal Regulations (CFR). Temporary: Temporary Regulations are regulations that are issued for a maximum period of three years. During this three year period the regulations are as authoritative as the final regulations. Given the fact that the Treasury Regulations are designed to interpret the Internal Revenue Code they are issued in conjunction with the code. Consequently, almost every section of the code has at least one corresponding treasury regulation that is issued for that specific code section. Therefore, it is important to find the relevant code section first and then find the treasury regulations that were issued and look at both the code section and regulations together. The final, temporary, and proposed regulations are first announced in the Federal Register. The Final and Temporary Regulations are listed as Treasury Decisions (T.D.s) in the Internal Revenue Bulletin (IRB), a weekly newsletter issued by the Internal Revenue Service and eventually compiled into the Cumulative Bulletin semi-annually. Looking at case law is very important in tax research given that there are issues that the code and regulations may not have adequately addressed. Tax cases can originate from three different courts including the U.S. Tax Court, the U.S. District Court, and the U.S. Court of Federal Claims. Most cases are filed in the U.S. Tax Court given the fact that any disputed amount between the IRS and the individual taxpayer does not have to pay until the matter is resolved. Should the taxpayer decide to file with the other two courts any disputed amount owed would have to be satisfied prior to filing with the court. Despite this tax cases are filed with the U.S. District Court because it provides the right to a jury trial whereas the U.S. Tax Court does not provide this. The U.S. Court of Federal Claims is the court where tax cases are least likely to be filed given that it does not provide the right to a jury trial and disputed amounts must be settled prior to filing with the court. Regardless of court of origin, it is important to remember that tax cases can be appealed to the U.S. Circuit Court of Appeals and eventually the U.S. Supreme Court. These decisions deal with substantive tax matters usually where there is a dispute between the IRS and the taxpayer regarding the code. This is often an area that has not been addressed by the courts. These are cases where there is no disagreement about the law but there is a dispute between the Internal Revenue Service and the taxpayer with respect to factual issues. In addition to the statutes, regulations, and case law there are a number of administrative materials available from the I.R.S. that a tax practitioner will need to utilize. The Revenue Rulings and Procedures will often refer to issues not adequately addressed by the code, regulations, or case law. While some of these materials including the IRS announcements and notices are purposely made available to the public most of these materials are only accessible because of the Freedom of Information Act. Researching online databases is the best method of finding many of these materials. The Law library contains a number of compiled legislative histories on major tax acts as well as the United States Code Congressional and Administrative News (U.S.C.C.A.N.). Tax Reform Acts from 1969, 1971, 1975, 1976, 1980, 1984, 1986, 1988. 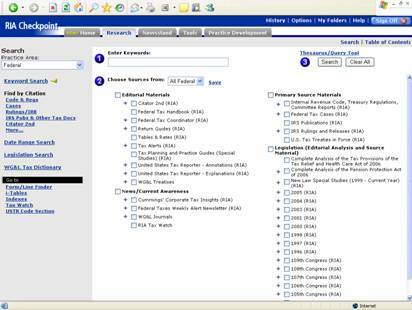 The LexisNexis Congressional Database will allow you to conduct more detailed and general legislative history research. The law library contains the CIS Congressional Information Services documents in microfiche (1970-2004), and Congressional Record Debate in print and on the HeinOnline database. 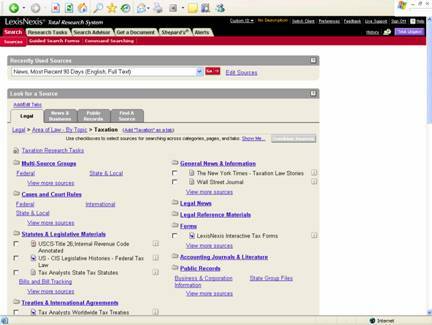 HeinOnline and LexisNexis Congressional are accessible through the terminals at the Law Library or through VPN access. Practice Guides such as the Federal Standard Tax Reporter include editorial analysis and annotations to the Treasury Regulations, cases, and administrative decisions. Handbooks provide convenient source of information for tax practitioner. They summarize almost every federal tax topic and contain a variety of charts. These are not meant for extensive research but are designed for quick information. Treatises and Hornbooks are ideal for legal research These are useful because they provide an overview of different areas of tax law and include annotations to statutes, cases, and administrative decisions for further research. Nutshells published by Thomson West are similar to hornbooks but are more concise. The periodical indexes provide a way to locate articles law reviews, journals, and other periodicals. There are numerous periodicals such as law reviews and journals that address topics and issues important in the tax area. Legal encyclopedias can be a good starting point for legal research and contain numerous discussions of the law on different subjects. These subjects are arranged alphabetically. The topic “Federal Taxation” is found in Volumes 33 through 34a. The Joint Committee on Taxation is a non legislative committee that works with counsel from the standing committees in the house and senate in drafting statutes and legislative history. The Joint Committee’s Blue Book published annually provides explanation of recently enacted tax statutes. International tax largely focuses on bilateral tax treaties and conventions. Often the tax treaties will deal with preventing double taxation and hiding assets offshore to avoid paying taxes. These are annual tax institutes that publish the papers of tax scholars on a variety of tax topics. Mertens Federal Income Tax is located in the M.D. Anderson library and is also available on Westlaw. The law library subscribes to a number of databases that provides information in the area of tax law in addition to the information available on Westlaw and LexisNexis. RIA Checkpoint, BNA Tax and Accounting, and Tax Analysts can be accessed through the Law Library’s Virtual Private Network (VPN) on the Law Library’s indexes and databases page. Westlaw and LexisNexis can be accessed directly through their website using issued passwords. Allows keyword and natural language searches through multiple sources of federal income tax law. Convenient access to IRS administrative decisions including the revenue rulings and procedures among others. 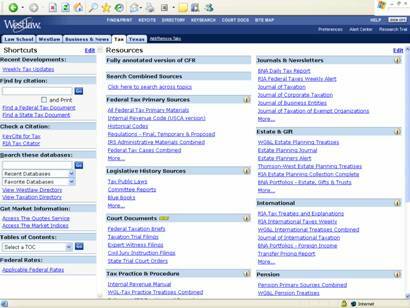 Compiles tax sources available on Westlaw and places them on one screen for easy access. 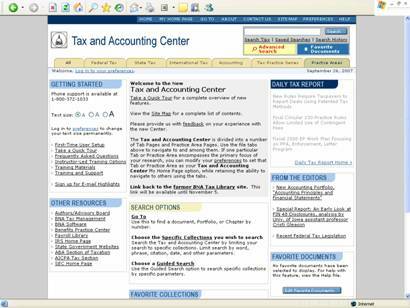 “Find a Federal Tax Document” allows you to use a citation to find a specific document. Use the “Add/Remove Tabs” at the top of the screen next to the tabs to add this feature. 1. 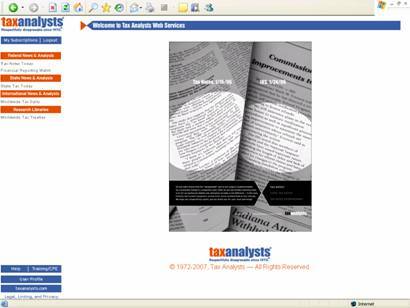 Tax Analysts Web Services provides federal, state, and international tax news, financial news as well as information on tax treaties. Our subscription includes electronic access to Tax Analysts Tax Notes Today, Financial Reporting Watch, State Tax Notes Today, Worldwide Tax Daily, and International Tax Treaties. 2. Tax Notes Today provides the latest federal income tax news. You can search current news and archives from 1987 until present. Search features include finding articles by code section and subject area. Commentary and analysis can be searched by author, subject, or title of the article. 3. Financial Reporting Watch provides current financial news, tax disclosures by company and industry, and includes an archival search feature. 4. State Tax Today provides access to the most current state tax news from all fifty states. You can search articles by state and subject area. Contents and highlights from the current edition are available as well as the archives from1987 until present. 5. Worldwide Tax Daily includes tax news from around the world and will allow you to find news by nation and subject area. Worldwide Tax Treaties features a quick treaty locator and will enable you to select from different nations and locate tax treaties available. You can search for all types of treaties between the United States and other nations and also retrieve legislative history for treaties. This database contains information on tax treaty conventions.